Several studies have shown that specific synaptic connections between pairs of pre- and postsynaptic neurons can reform in cell culture. True synapse specificity is, however, best tested at the network level, where neurons are concurrently challenged with multiple partners. It is also imperative to demonstrate that functionally defined networks of neurons are able to generate patterned activity in a manner similar to that of in vivo. The molluscan models were the first in which networks of functionally defined circuits were reconstructed in culture. 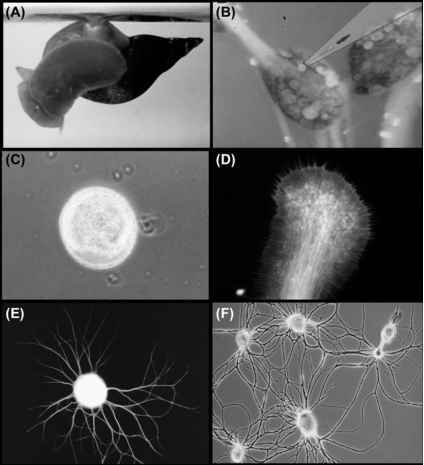 Specifically, the neural network mediating gill withdrawal reflex in Aplysia was reconstituted in cell culture where the neurons not only re-established specific connections with their select partners but also exhibited synaptic plasticity that underlies learning and memory in the intact animals12. Similarly, the Lymnaea preparation was the first in which a three-cell network, comprising the respiratory central pattern generator (CPG) was reconstructed in culture. The co-cultured respiratory neurons not only re-established their specific synapses in vitro, but they also generated rhythmical patterned activity that was similar to that seen in vivo13. 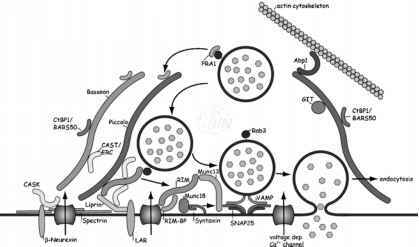 This in vitro reconstructed CPG has since been used to define fundamental mechanisms of synapse formation as well as respiratory rhythm generation. These studies underscore the importance of molluscan models for elucidating mechanisms underlying not only network connectivity but also how such interconnected neurons generate rhythmical patterns in a manner similar to those seen in the intact brain. Figure 2.1. Cell Culture Techniques. (A) The pond snail Lymnaea stagnalis. (B) A cell extraction pipette is positioned to isolate individual neuronal somata. The arrow depicts neuronal extraction in progress. (C) An acutely isolated Lymnaea neuron in culture. (D) A Lymnaea growth cone fluorescently labeled with actin (red) and tubulin (green) antibodies. (E) An isolated neuron exhibiting neurite outgrowth overnight. (F) Interspecies synapse formation between Lymnaea and Helisoma neurons. A neuronal "hybrid" network reconstructed from two different snail species. Original copyright notice: Figure 2.1A reproduces Figure 3A on page 543 in J Comp Physiology A, volume 169, from the article by Syed, N.I., Harrison, D., and Winlow, W. (1991) Respiratory behavior in the pond snail Lymnaea stagnalis. Figures 2.1B, C and E reproduce Figures 2B, C (page 363), and 4C (page 372), respectively, of the book on Modern Techniques in Neuroscience Research (1999) Eds: Windhorst, U. and Johansson, H. Authors: Syed, N.I., Zaidi, H., and Lovell, P. Chapter 12: In vitro reconstruction of neuronal networks: a simple model system approach. All figures are reproduced with kind permission of Springer Science and Business Media. See Colorplate 2.